My load balancer probe isn't probing. 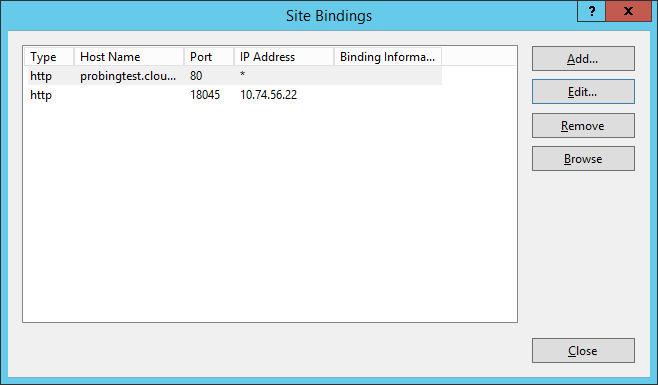 Today I tried to define a custom load balancer probe on a worker role in Azure. On this worker role, IIS and other components were installed and configured using PowerShell scripts. The probe was configured to listen on port 18045 in my service definition file, which is also what I saw in IIS. On the machine itself I tried to make the same call as the load balancer, by IP address. http://10.74.56.22:18045 failed with a 503 error. How does it looks now? We needed to explicitly set an IP address instead of * like we were doing. After redeploying, everything started to work as expected with the custom probe.